CMP Modular Storage Shelving are heavy duty, configurable shelves constructed of stainless steel. 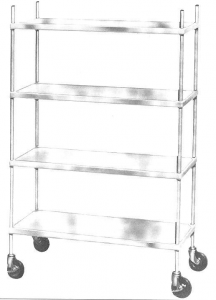 A variety of configurations are available, with and without casters. If you don’t see what you need, or you have other questions, please contact us. Maximum height 87″ (2,210 mm). Shelf depths: 14″ (356 mm), 21″ (533 mm) or 27″ (686 mm). CMP’s Modular Storage Shelving shall be constructed of stainless steel and available in a variety of configurations – three to six tiers in height, three unit widths to 48″ (1,219 mm) and three depths to 27″ (686 mm). Casters shall be added for mobility, as required, and special features shall be available , such as counter with Formica or stainless steel top, integral sink and coved backslash; drawer under counter and sloping dust top. Each post bracket is to be encased and concealed within shelf as an integral part. There are to be no cutouts to weaken corners, and no external attachments to work loose. Corners are to have no dirt-collecting notches or crevices. Shelf itself is to be single pieve of metal with smooth top surface, inverted “V” type edges and raised corner areas surrounding posts, thus preventing spills from running off edges or down through post openings. These strength and sanitations features are to make CMP shelving ideal for storage of food as well as linen, utensils, dinnerware, supplies and medical instruments. Each shelf shall be drawn from single sheet of No. 18 gauge (1.2 mm) stainless steel with full drawn 5/8″ (16 mm) radius corners (notched corners not acceptable). Shelf edges shall be flanged down 1 1/4″ (32 mm) on all four sides and in 1/2″ (13 mm) at an angle of 60 degrees. Fully concealed bracket shall be held rididly in place in each corner by fomring shelf into bracket. Set screw shall be provided to lock shelf at desired height on uprights. Surface of shelf shall be depressed 1/4″ (6 mm), formed raised, rounded edge around entire perimeter to provide added rigidity and to contain spillage. Shelf widths shall be 36″ (914mm), 42″ (1,067 ,,) or 48″ (1,219 mm); depths available shall be: 14″ (356 mm), 21″ (533 mm) or 27″ (686 mm). Uprights shall be 1″ (25 mm) O.D., 16 gauge (1.5 mm) stainless steel tubing positioned within periphery of shelf. For stationary limits, each upright shall be fitted with top cap and stationary cushion flange. Maximum height shall be 87″ (2,210 mm). Angle Bearers shall be provided where required for multiple sections. Sanitary cusion flanges, number E-62, shall be furnished as standard on all stationary units. 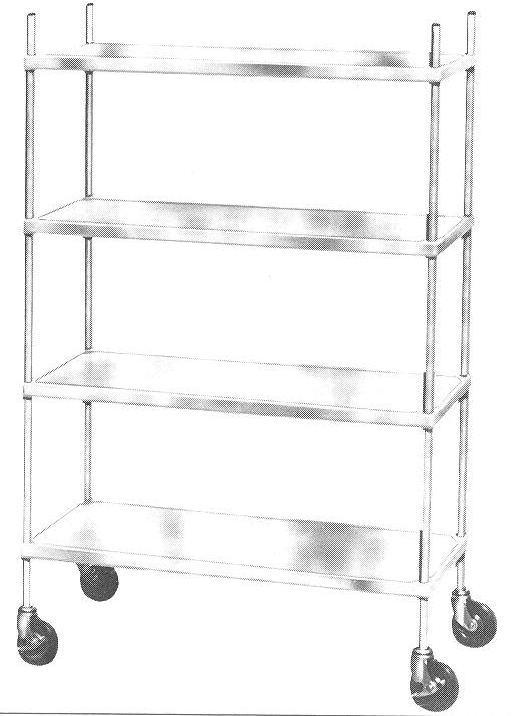 5″ (127 mm) diameter castees with chrome plated forks, sealed bearings and non-marking rubber tires shall be furnished as standard on all mobile units. Shelving shall be constructed of stainless steel.